The alternative rock band The Presidents of the United States of America formed in 1993 in Seattle, USA. The band consisted of Chris Ballew, Jason Finn, Andrew McKeag and Dave Dederer. In 1995 they released their self-titled debut album. Party thanks to the success of the singles, the album became a big hit in the USA, but it also did well in the UK. Their biggest hit was the song 'Peaches'. It reached number 8 in the UK singles chart. 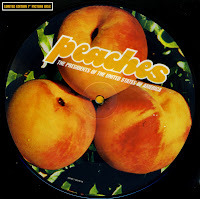 Although the meaning has been argued, the band has stated that the song is just about peaches. Chris Ballew said that he wrote it about a girl he once had a crush on. He allegedly wrote this song after sitting under a peach tree she had in her yard while waiting for her.